Come and meet us and find out more over a tea or coffee. We are at the Tramway cafe, 25, Albert Drive, Glasgow, G41 2PE. It is a very potent time now with there being opportunties and changes afoot, in and around PenCoHo. We are delighted to invite you, 22nd November! Organised as a positive response to the recent Scottish Government’s Self and Custom Build event, the Making Co-Housing Happen Event in November will focus on how Co-Housing can contribute to achieving outcomes in the Planning Review. We will also look at land, finance and delivery. Evidencing the benefits and possibilities of co-housing and the life choices of people who may live there. Mapping out the necessary skills, pathways and organisational landscapes to support more capacity in more people to deliver co-housing living effectively. Facilitated round table discussions, led by Matt Bridgestock of John Gilbert Architects. What are the links between the social aims and values of sharing and collaborative housing and spatial forms designed for community or privacy? What does affordability mean in the context of co-housing, and how does cost affect who can access this type of housing? How much does sharing reduce costs? How can design respond to social and ecological concerns, foster contact between residents and incorporate technical innovations? What needs to happen for co-housing to develop into a widely accepted housing option in Scotland? What are the specifics of the cohousing agenda in terms of policy, financing, land provision and housing delivery? What can we learn from other community-housing approaches and from international examples? Feedback from the roundtable discussion presented by facilitators and volunteers. Conclusion and commitment to produce conference note for policy makers, practitioners and communities. Thanks to Glasgow City Council for providing the event venue free of charge. Our October drop-in this Saturday 8th, 10.30 am – 12pm, will include making a wee nature mandala to celebrate autumn! We will meet at the first table in the cafe first, the one with the green and beige sofas. Then we are planning to enjoy the sun in the hidden garden and make a nature mandala! Maybe take inspiration from our logo? The weather forecast seems good, so lets enjoy it and ourselves! Bring your own wee nature treasures or take a walk in the hidden garden to find nature’s gifts to co-create beauty. Hope you can make it ? Here comes a cordial invitation to our next drop-in session, Saturday 10th September, 10.15- 11.15am, in the Cafe of the Royal Concert Hall. You can share this invitation also via our facebook event page https://www.facebook.com/events/1256337597734152/ and use twitter to spread the word. date and venue for forthcoming Scottish CoHousing Cooperators event has changed from the 8th November at the Light House to the 22nd November at the Glasgow City Chambers. More details to come soon via Daniel Mackendry from A&DS (Architecture and Design Scotland). This is a by invitation only event, for people already active in either Cohousing or other forms of community led housing with an interest in Cohousing. The outcome of the event is hoped to pave the way to easier routes for getting CoHousing off the ground in Scotland. If you wish to be invited, please email <pencoho4u @ gmail.com > to be referred to Daniel. middle of August we had a great time visiting the award winning Castle Rock Edinvar over 60s independent living housing development Fortune Place in Edinburgh. Hopefully you find a wee report on this inspirational visit here on our website soon. one of our members visited Scotland’s first and so far only exisiting CoHousing project, East Whins, near Findhorn, end of July. Report still forthcoming from there too. the architectural plans are being redesigned for our St Andrews Drive development to bring the costs down and more people in. Come and see us next Saturday the 10th September, from 10.15am – 11.15am (usually we are still there at 12pm) to find out more. We had a very lively drop in last month in the Tramway, and felt so energised afterwards. Also because we have learned from two folks who came along that they are planning another CoHousing development in the Dear Green Place of Glasgow, one that aims to do self build. It brings us hope for Scotland to make a breakthrough for CoHousing soon. It is exciting times. Come and join us. Contact Ann MacInnes to speak to her if you want to know more about how to join us, especially if you can not make it to the drop-in. Full contact details at the bottom of each page here on our website. Looking forward to hear and see you. It has been a couple of exciting weeks: we’ve had to start to rethink the plans because of the quantity surveyor’s initial costings! We are now working our ways forward together with SHA (Southside Housing Association), JM Architects, and Steven Tolson our housing consultant, to make our project affordable and to have the rented option viable. All PenCoHo Members and Associates are invited to attend a mid-day meeting with Steven next Tuesday to be heard and involved. We welcome your views, even if you are still at the stage of ‘finding out’ about co-housing and whether it’s right for you. So, if you have not yet written or sent off your application for Associate Membership and wish to join in this ground breaking project at this vital stage, please click here and download the form, and get in touch with Barbara by next Monday, 27th June. Thanks to having the first draft of Architectural Plans available for discussion, and with having monthly drop in sessions now, we’ve made a great push forward. We have 4 new Associate members who are really keen to learn more about how Senior CoHousing can work. More PenCoHo Members and Associates meet whenever they can and are starting to be “hands on”, contributing their knowledge and skills with things that need doing. There is much that needs action, especially outreach to find more members, so our Working Groups are beginning to evolve, members are meeting informally and our community is learning and growing together. At the Drop-ins: Here is the flyer with the dates for the drop-in sessions up to the end of year. But you can also contact us anytime to meet and talk with a PenCoHo member. Just get in touch. Contact details are on poster above, or reply here in the comment function below. If you are already active in community led housing, self build, or if you are a housing professional, an architect, or a policy maker, then you might be keen to find out more about an event led by Daniel MacKendry and team from A&DS, in autumn 2016 (as part of the 2016 Year of Innovation, Architecture, and Design and the Festival of Architecture). Plans are shaping up right now for this nationwide gathering of innovative housing and cohousing practitioners in Glasgow’s Lighthouse, to have an in depth look at the barriers and possibilities for cohousing in Scotland, and how to dissolve the former and help to manifest the latter. Please get in touch with Daniel and pass the word to everyone who may qualify to attend. PenCoHo’s appreciation goes to the whole team of all the above mentioned people and organisations. It is a privilege to be part of a growing groundbreaking group and wider community, keen to work together on our pioneering project to build Scotland’s first Senior Cohousing development in Glasgow. We know that in years to come different models of Senior and other Cohousing projects will become viable because we are sticking together with imagination and flexibility, one step at a time, paving the path to the shared vision of good housing solutions for older people. 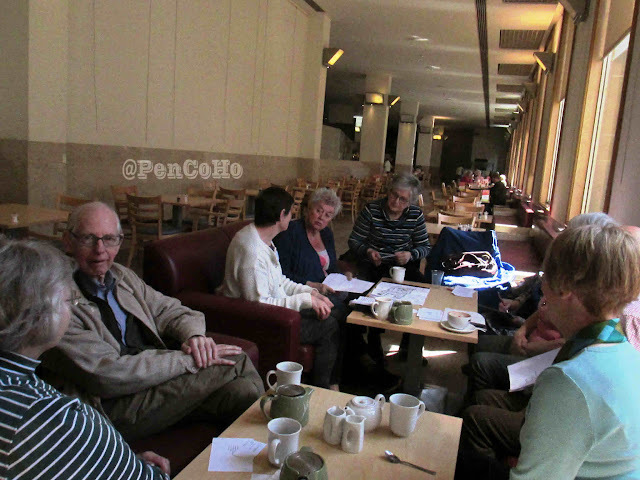 The drop-in Coffee morning in May at the Concert Hall Café was both engaging and stimulating. The sun shone through the windows and the architects’ plans seemed to find warm welcome, and everybody’s presence made for a warm welcoming company. We now have three new associate members! Hope they all read this here, and receive our thanks for letting their picture be taken so we can share our joy with the wider world. One has to do that these days via that Social Media business, you know! So that the joy to be shared now more often and more widely, we have decided to have monthly social drop-in sessions. We have now added a social meeting on the south side, at the Tramway, alternating with the meetings at the Concert Hall café, so there is now a drop-in coffee morning gathering on the 2nd Saturday of every month. Please pass the word: our next drop-in session is 11th June, 10.30 AM at the Tramway Café, 25 Albert Drive. If the weather is good we might be outside on the Terrace, or take a wee wander round the Hidden Garden ! Confirming you are coming via text or call to 07818 061918 would be great, because it helps us to book an appropriate table size. Children and grand children of interested, or to be interested, elders are very welcome. @PenCoHo – tweet about us, follow us! The time is now: Join in with exploring Cohousing and learn about the Penington Senior Cohousing project planned to be built not far from here. Tramway Café has nice food!